I think that today, this might be my new favourite food. 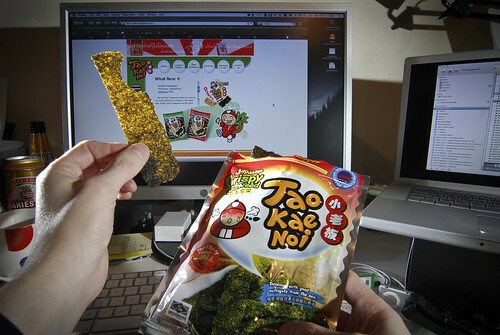 Mmmm, crispy seaweed. Delicious, and with good nutrients from the sea. What more could you want from a snack? Get down to the Asian Superstore on Vicars Lane if you are in Leeds, it is better than dry old turkey at any rate. Seaweed lit with my new blackdrinkingstraw gridspot... (http://lightingmods.blogspot.com/2007/06/diy-black-straws-snoot-grid-part-1.html) on SB26, 1/2 power, optical slave, through the snack from camera left. Main light is a bare Viv 283 dialed down to 1/16th with a VP-1, camera right. Shutter slow (1/6th ish) to get some ambient (monitor), f/9 for a bit of depth of field. This is a Flickr badge showing public photos from altitudezero. Make your own badge here.